Exposure to mold (especially black mold) may cause respiratory problems. You should address this problem promptly if you detect mold in your house or place of business. Keep your family or employees free from health hazards and protect your property from further damage. Mold always becomes a problem in a home or business whenever there’s excessive humidity or moisture over a period of time. This may be caused by a roof leaking, a flood, spills from burst pipes or leaky plumber fittings. There are even cases where mold is brought about by moist air which condenses on a cool surface. Mold can grow anywhere in your home or business premises as long as conditions allow. If you notice visible growth of black mold (or any type of mold) on wall, floor, or painted surfaces you should be concerned about the possibly of a greater amount of mold on the other side of the wall or floor. 1. A strong, musty odor emanates. 2. Allergic reactions whose cause cannot be explained. 1. Identify moisture sources which are causing the mold in the first place. 2. Evaluate undetected and visible mold growth. 3. Contain the damage caused by mold to the smallest area possible. 4. Treat and remove (physically) the mold. 5. Dry all materials in the house to prevent the mold from re-propagating. 6. Recommend and even perform procedures that restore your property to its previous condition. 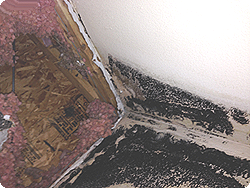 The primary aim of mold remediation is to neutralize the source of the moisture and the physical removal of the mold. The contaminated site will be well ventilated to prevent build-up of moisture. Special chemicals are applied to kill mold and mold spores. This will prevent spores from propagating throughout your house or business. Do not use bleach, fungicides, UV light, dry air or high heat to remove mold as it may do more harm than good. Learn more about property restoration.